In Montana, the wildlife outnumber the people, and the stars outnumber both, but that doesn’t mean you shouldn’t protect yourself and other drivers with the right car insurance policy. We understand that navigating your options in car insurance can be as challenging as driving the Beartooth Highway. You are not alone in your hunt for a great car insurance policy! Are you ready to make an informed decision while you wait for that herd of elk to cross the road? While you wait, review the following guide we put together that includes all you need to know about Montana car insurance including coverage and rates, car insurance providers, state laws, and so much more. The “Treasure State” is a great place to live if you love the open road, the great outdoors, and wildlife. Montana shares with Wyoming Yellow Stone National Park which was the first national park in US history. Before you decide to drive Montana’s dinosaur trail, consider your options in car insurance coverage. Liability insurance pays all individuals — drivers, passengers, pedestrians, bicyclists, etc. — who are owed compensation for property damage and/or injuries resulting from a car accident that you or anyone under your policy causes. Montana is an “at-fault” accident state. This means, if you are the at-fault driver during an accident, you will be held liable for any personal injury or property claims. Your liability coverage does, however, kick in no matter who is driving your car. Lost or expired proof of insurance card? No problem…almost. The state of Montana developed a web-based verification system (MTIVS) for up-to-the-minute data to confirm if a vehicle has minimum liability insurance coverage. This system can be accessed by drivers and law enforcement anytime, anywhere. However, the MTIVS cannot verify insurance from out of state, so if you are new to Montana, and you have not yet obtained Montana car insurance, be sure to carry proof of out-of-state insurance at all times. Furthermore, the web-based system is not always accurate and up-to-date and has been causing problems for law enforcement officers and courts. Because you’re still required to carry proof of insurance in Montana, your safest bet is to do that. Driving without the minimum liability coverage in Montana is a misdemeanor. The penalty for a no-insurance citation is between $250 and $500 or up to 10 days in jail for a first offense. Penalties increase for repeat offenders and also include revocation of your driver’s license for 90 days and five points on your driving record. What makes MTIVS so great? Troopers will use MTIVS to electronically verify that liability insurance was in effect for the person at fault at the time of an accident, so don’t bank on purchasing car insurance while you wait for law enforcement to arrive on the scene. Montana is known as the “Treasure State” for its history of gold and silver mining, but that doesn’t mean you’ll be rich living there. In 2014, the annual per capita disposable personal income in Montana was $36,041. The average annual cost of car insurance in Montana is $869, which is almost 2.5 percent of the average disposable personal income. The average Montana resident has only $3,003 each month to buy food, pay bills etc. The car insurance bill alone will deduct about $73 out of that — much more if you have a less-than-perfect driving record. American Consumer Credit Counseling suggests saving 20 percent of every paycheck. With Montana’s DPI, that’s a whopping $600 each month! How much are you putting aside for savings? The above table illustrates the most recent data provided by the leading source on the matter, the National Association of Insurance Commissioners. Expect car insurance rates in Montana to be significantly higher for 2019 and on. Don’t forget: Montana has minimum requirements for liability coverage, but experts suggest drivers purchase more than what state law requires, especially when the state is an “at-fault” state like Montana is. You may be wondering: Why get more coverage than required? Montana has the largest migratory elk herd in the nation. The average square mile of land in Montana contains 1.4 elks, 1.4 pronghorn antelope, and 3.3 deer. With more big game animals than humans per square mile in over 82 percent of Montana’s counties, comprehensive coverage may be wise to consider. Comprehensive car insurance covers occurrences that many would call “out of our control” such as a cracked windshield, hitting an animal, or other events besides collisions. In the spirit of Montana’s gold and silver mining history, let’s dig into some of the most popular coverage options to add to a basic auto insurance policy. A loss ratio shows how much a company spends on claims to how much money they take in on premiums. A loss ratio of 60 percent indicates the company spent 60 on claims out of every 100 dollars earned in premiums. Med Pay and Underinsured Motorist coverage are both optional in Montana; however, Uninsured Motorist coverage is required. All three are important. Why? In 2015 13 percent of motorists in the US were uninsured, and 10 percent of motorists in Montana, despite that driving without insurance is a misdemeanor. Montana ranked 33rd in the nation in 2015 for uninsured or underinsured drivers. By requiring uninsured motorist coverage, the strict laws of Montana have seemed to decrease the loss ratio. Unless you sign a form stating you do not want Uninsured Motorist coverage, your agent is required by law to provide it to you. Montana’s temperatures can change drastically in a short period of time – sometimes in as few as seven minutes. Some cities have recorded temperatures as high as 117 degrees F and as low as -70 degrees F.
Aside from the usual preparedness of carrying flashlights, blankets, and keeping your vehicle fluids topped off (and dressing in layers), keep an eye on those tires as well! One extra that is particularly important in Montana is Emergency Roadside Assistance. With temperatures rising 82 degrees from morning to afternoon (Fort Belknap, MT in 2018) or falling some 84 degrees in 12 hours (Fairfield, MT in 1924), pay attention to tire pressure because it changes by one pound per square inch (PSI) for every 10 degrees of temperature change. If you don’t regulate your tire pressure, you just may find yourself needing roadside assistance. What causes these extreme temperature shifts? It’s the “snow-eating” Chinook winds explained by this very engaging Canadian Meteorologist. Here’s a list of other useful coverage available to you in Montana. In Montana, it’s illegal to consider gender and marital status in rates. Montana was the first state to secure laws against gender discrimination in determining insurance rates back in 1985. Six other states, most recently California, have also instated laws based on gender and/or marital status. Case in point, Allstate F&C charges 17-year-old drivers approximately $10,485 annually, which is several thousand dollars higher when compared to their averaged $2,735 yearly premiums for insureds over the age of 18; this is a 78 percent difference! Safeco, however, charges only 48 percent more in annual premiums based on age difference. Take a look at the table above, listing the most/least expensive carrier rates according to the city. As you can see, your location is a significant factor in the rates you can expect to pay. No need to worry, we’ve got you covered! Keep scrolling to find out who the 10 largest providers are across the state. Besides premiums, one of the other components that should factor into your decision when picking an insurance carrier is customer ratings. Want to find out what customers really think about the top Montana car insurance carriers? Company complaints specific to Montana are not tracked. However, on a national level, the number of complaints and the ratio of complaints per 1,000 automobiles from 2017 are listed below for the top 10 insurance companies in Montana. We understand that rates are one of the biggest, if not the biggest factor when you pick Montana car insurance. The above chart shows eight of the top carriers in the state, along with their average rates compared to the overarching state average. Our researchers discovered that Allstate F&C charges the most in average premiums, with Mid-Century coming in at second place for the highest annual rates. Meanwhile, Safeco comes in number one for the most affordable average rates. The table above compares the rates of top carriers in the state against average commute times. Interestingly enough, Allstate comes in again with the highest premium ratio to annual mileage. According to a study conducted by Experian, the average resident of Montana has a credit card VantageScore of 689 and around 2.87 credit cards in their name. The average Montanan consumer has a credit card balance of $5,845. If you think that your credit card debt and car insurance rates have no correlation, think again. Insurance carriers run credit checks on their insureds to assess the likelihood of them filing a claim at any point. If your credit score doesn’t meet their standards, you might just see a spike in your rates, regardless if you’ve had an accident or not. As you’ll note in the table above, your driving history has a direct effect on the premiums you can expect to pay. If you look at the rates listed for GEICO, for example, you’ll notice that the rate difference for a clean record vs. one DUI is over a $3,300 premium jump which is a 59 percent increase! Keep reading to learn about the laws specific to the state of Montana. Car insurance laws vary from state to state, and Montana is no different. Montana has important laws worth noting, especially as it relates to age. Teens as young as 14 and 1/2 can obtain a learners permit. This may seem a bit early to you, so there are limitations, but they are still permitted to use a cell phone for any purpose while driving. Additionally, drivers over the age of 75 are required to renew their license only every four years. Montana also has no restrictions on helmet usage for motorcyclists or bicyclists. Also worth noting is that their seat belt laws are under secondary enforcement only which means an officer must be enforcing a primary law in order to issue a seat belt citation. Do you know what’s really crazy? Seat belt nonuse cannot decrease monetary awards for injuries in lawsuits – and the seat belt laws in Montana have not been updated since 1987. The lack of restrictions in Montana based on age and safety is more reason to get the right coverage, especially when it comes to protecting other drivers with the required uninsured motorists coverage as well as additional liability coverage. The Montana Automobile Insurance Plan was created to provide automobile insurance coverage to eligible risks who seek coverage and are unable to obtain such coverage through the voluntary market. Eligible Montana Automobile Insurance Plan risks are shared among companies writing automobile insurance in the state of Montana. Montana is one of several states that comprise an association of auto plans referred to as the Western Association of Automobile Insurance Plans (WAAIP). WAAIP is a processing center where people who have trouble buying automobile insurance are put in touch with an insurance company which will insure them. The state of Montana currently does not provide any special low-cost insurance programs. Montana law requires drivers to carry a minimum amount of liability insurance. Penalties for not having insurance can be severe. You can’t afford not to have insurance. While some states mandate a waived deductible for windshield repairs, and others specify the use of only manufacturer replacement parts, Montana has no laws specific to windshield coverage. Insurance fraud is a criminal offense in the state of Montana, occurring when an individual attempts to deceive an insurer to receive benefits or payouts they are not qualified to obtain. Montana Code Annotated 2017 statute 27-2-4 outlines nine exceptions to the three-year personal injury and two-year property damage limitations. Now, we all know that you can’t drive a car without a license. Let’s find out what Montana’s mandatory vehicle licensing laws are. Practically speaking, you won’t do jail time for a first or second no insurance offense, but you will pay a fine. The state of Montana developed a web-based verification system (MTIVS) to confirm if a vehicle has minimum liability insurance coverage. This system can be accessed by drivers and law enforcement anytime, anywhere. Full License 16 years old if held provisional license for at least 12 months. The Montana Motor Vehicle Division handles all matters related to vehicle licensing. New residents must apply for a Montana driver license within 60 days of moving to the state if seeking a non-commercial driver license and within 30 days if they need a commercial license. New residents also may be required to pass written and road tests, in addition to a vision test, unless licensed in another state in which case these three tests may be waived. Maximum posted speed limits are 80 mph on rural interstates, 65 mph on urban interstates, and 70 mph during the day and 65 mph during the night on both limited access roads and all other roads. In Montana, when two vehicles meet on a steep road that isn’t wide enough for both to pass safely, a vehicle going downhill should yield the right-of-way to a vehicle going uphill. Montana’s negligence laws err on the side of 51 percent comparative negligence. If you wish to pursue a case against the at-fault driver for additional damages, you must prove negligence on behalf of the other party as direct causation to your injuries. However, the injured individual must be less than 51 percent at fault to claim damages. If it is discovered that you were 51 percent or more at fault, you would not be able to proceed with a claim against the other driver. Furthermore, if you bear less than 51 percent of fault in the accident, the percentage of fault you carry will be subtracted from any damages you do recover. Now, before you get out on the open road in the Treasure State, you need to know the rules so you can stay safe and keep your rates down. The first thing to know is that Montana follows a traditional fault-based system when it comes to financial responsibility for losses stemming from a crash: that includes car accident injuries, lost income, vehicle damage, and so on. Montana’s 2017 annotated statute 61-8-321 states that you should keep right if you are driving slower than the average speed of surrounding traffic with four exceptions. Move over laws in Montana require that when emergency and maintenance vehicles are on stopped on the roadside, drivers move into a non-adjacent lane if safe and prudent to do so. If unable to move into a non-adjacent lane, drivers must slow down. Violation of Montana’s child seat law may not only put the child in danger, but could result in a base fine of $100 plus additional fees. Children six years of age and up who weigh 60 pounds or more are allowed to sit in all seats with no preference for the rear seat. It’s important to note children may not move out of child safety seat until both requirements are met: six years and 60 pounds. Montana does not impose restrictions on who can ride in pickup truck cargo areas. Rideshare services like Uber and Lyft mandate that all their drivers carry personal car insurance policies that align or exceed the minimum coverages dictated by state law. Drivers rarely carry their own commercial insurance coverage; however, Farmers does provide rideshare insurance. Currently, Montana has no restrictions on autonomous vehicles. But wait, there’s more! Let’s dig deeper into Montana’s safety laws to protect you on the open road. Montana currently has marijuana-specific impaired driving laws. The blood level is not to exceed five nanograms of THC per se. 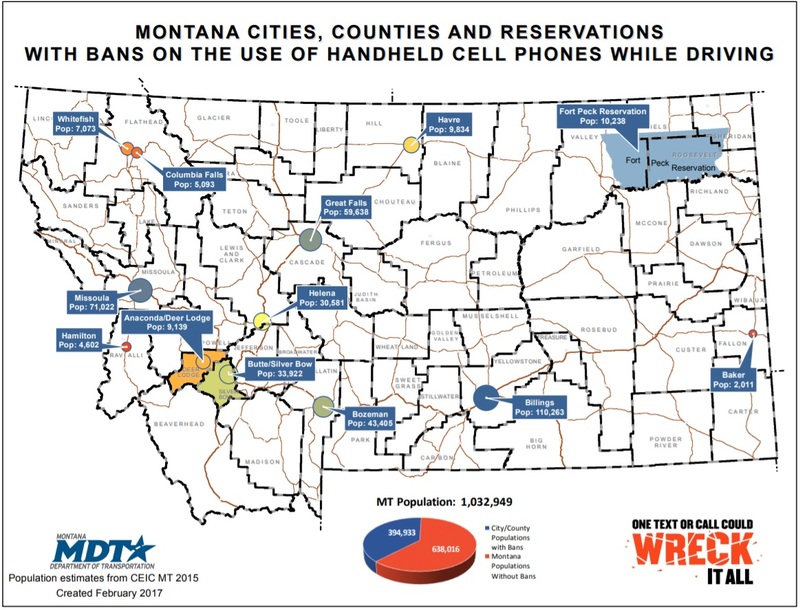 The state of Montana currently has no ban on texting and hand-held devices for all drivers. It’s the only state in the US that has no bans for cell phone use while driving. Be aware, though, that although there are no state-wide bans, select cities and counties – where over 1/3 of the population lives – have enacted handheld bands. In fact, all the major cities with the exception of Kalispell have handsfree laws. Check out this map below. Do you want to know how safe it really is for drivers in Montana? Well, the data our researchers found might surprise you. In 2016 alone, there were just over 1,600 motor vehicle thefts in the state of Montana. Here are the top 10 stolen cars in Montana. If you live in Montana, chances are you live in a two-car (or more!) household, drive alone to work, and spend a hefty amount of your day commuting! With an average commute time of 16.4 minutes, Montana ranks below the national average, but with over 76 percent of the population driving alone, that commute doesn’t exactly rank Montana as the greenest state when it comes to carbon emissions. Some Montanans (1.55 percent to be exact) even suffer through a “super commute” — spending in excess of 90 minutes in the car! Is traffic a major problem in Montana? The time spent in traffic doesn’t compare to a city like Los Angelos, that’s for sure, but as people flood into the state, metropolitan areas are experiencing significantly more traffic.